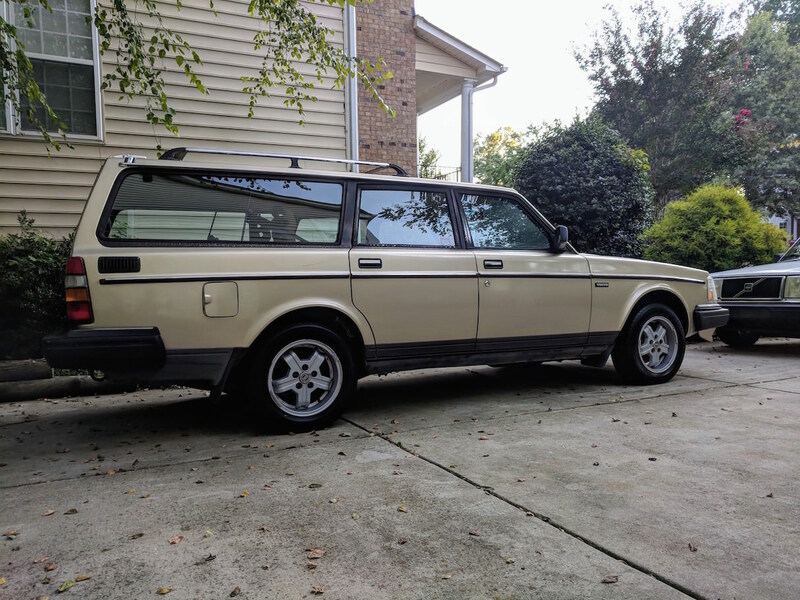 I found it on CL in Charlotte listed originally for $850 (which caught my eye), but learned the seller had increased the selling price to $1100 as he was able to get it inspected. Figured I should check it out anyway, drove the car and offered him $960. It was his son's car for the last 4 years, and he didn't need it any more. The son had done some maintenance including brakes F/R, timing belt, accessory belts, shocks/struts (Sachs), crappy tires and water pump. Since the garage that inspected it needed to change the fuel filter to get it to run properly, I deduced that it would need fuel pumps since the old filter was pretty plugged up. The only other issue was a clunk in the driver's front end, and a shimmy in the steering wheel (which I fixed by tightening the driver inner tie rod which was about 1/2-in loose and then adjusting the toe...yikes!). So I got the car home and ordered two fuel pumps and ball joints from Rockauto. I also found a folder with the car's maintenance history from the first two owners and 205K miles (it currently has about 270K). It was a well cared for car and was serviced at the same shop in Salisbury, NC up to the 205K mark. Fuel pumps fixed the stalling problem, and I cleaned out the old fuel by dropping the tank as well. I put in a j/y fuel sender that cured the non functional gas gauge. I then installed the ball joints, and afterward the front was still clunking. I figured it was the control arm bushings, ordered some poly from FCP, and went to install them. Upon removal of the driver side control arm, it was very apparent that both front and rear bushings had been replaced recently (plus both had Made in Sweden markings, so maybe decent parts). I then popped the tie rod end, and both inner and outer tie rods are tight and good. I checked the brake pad clips and they are in place, but it is missing one of the small clips that hold the brake pins in place, but all other parts are there. The strut bearing looks newer, and I assume it was replaced when the new struts went on. I bounced the car and the bushing didn't deflect much at all. I also snugged the gland nut on the strut, but it was pretty tight. The nut on the top of the strut mount also looks well-seated. I am at a loss as to what could be causing the knock. It happens when you hit a pothole or manhole cover. Does the Volvo strut assembly contain a spacer or washer in the strut mount assembly (I can't recall)? I know that MK1 VWs have a spacer that if missing, will cause a horrible clunk in the front end. Other than that it runs well. Paint is dead on hood and roof, but no rust. I picked up the Virgos with decent Goodyear tires (mfg'd in 2015) at pull-a-part for $35 each, and a set of tan cloth seats as well. I don't see any mention of sway bar end links or bar-to-frame bushings. 1990 740GL, now in extra-small economy size. Top 24mm nut snugged down? Check what MasterBlaster said above as well. Also if you use the poly kit from FCP you need to burn out the rear control arm rubber and keep the sleeves intact (not a bad idea to have them tack welded in place either as I've heard they can slip). I disconnected the sway bar end links (top bushings good, bottom a bit squished) and drove it unattached and still had the clunk. I believe the top 24mm nut is snug, but don't have the proper wrench to tighten it while holding the shaft secure. It looks like it has the same amount of threads showing as the other side. Yeah the reason I didn't proceed with the control arm bushing replacement was due to the burning. It didn't seem to make sense to burn out perfectly good bushings (plus burning and removing the sleeves for the front control arm bushings is a bit of a pain). Would the bar-to-frame bushings clunk if the end links are disconnected? i had a mystery clunk, that turned out to be the blower motor. It would make noises when hitting bumps (but only of the fan is on). I swore for months it was something suspension related. My 244 had a clunk after I put new Sachs struts in it with new aftermarket mounts. Put a couple washers in there and the clunk disappeared. Worked for my swivel chair, too, actually! So take off the plastic covers on the mounts and push down on the fender. If you notice any movement of the strut arm (or whatever it's called - I did this ages ago and I've not messed with struts at any other time in my life) besides the normal pumping motion, like a sudden knock as the arm wiggles in the mount, that's your trouble spot. For whatever reason, only the driver's side strut did this when I replaced mine. Passenger side was fine. I looked at the exploded view of the suspension components on Tasca's website and it appears that a washer does go between the strut mount and the securing nut at the top of the strut. Guess I'll add a washer or two and see if that works! Is the battery fixed tightly? I had this fool me for days. Find More Posts by Martin L.
It's the washer, I visually checked and yep driver side has no washer under upper strut nut. Just have not had time to get the in tank pump sealed (resorted to ordering the tool from IPD as the old BFH and flathead screwdriver method would not work). Found a good size washer at Lowe's and will drive to my buddy's to zip off the strut nut with an impact once it is up and running. Not so fast mister. When diagnosing clunks, DON'T FORGET TO CHECK THE OTHER SIDE ...the gland nut on the passenger strut had backed completely off. It is now back on and car is nice and quiet - I also drilled a hole and put a small speaker screw/nut on the buzzing catalytic converter heat shield to stop that noise as well.